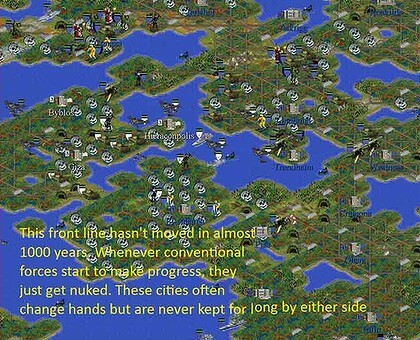 A recent post on Reddit sparked a swell of interest in one man's game of Civilization II. It became popular so fast that a subreddit was created on the subject and numerous redditors have joined the fray, offering assistance, playing the same game of Civilization themselves, and even writing a short story inspired by the game. The reason for its immediate fandom? User Lycerius has been playing this same game for ten years, maintaining the endless battle of Civilization off and on for more than a decade, well after the game completed its normal cycle. The conditions of this unique game world read like a page from dystopian novel: "The world is a hellish nightmare of suffering and devastation. There are 3 remaining super nations in the year 3991 A.D., each competing for the scant resources left on the planet after dozens of nuclear wars have rendered vast swaths of the world uninhabitable wastelands." 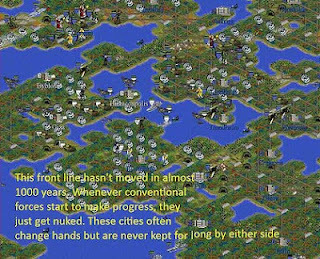 The opportunity seems ripe to interrogate the Civilization series for its sociopolitical assumptions and its political implications. However, the franchise has already received plenty of criticism from myself and numerous others. Yet I do want to talk about what this sort of constant stale mate might illuminate about digital and real world systems and how they change. I recently came across the word "tensegrity". It is an ugly portmanteau for tensional integrity, an architectural principle that describes self-supporting structures of isolated components held stable in a position of constant tension. These structures, commonly made of rigid pieces that never touch but instead hold each other aloft with a set of cables, are surprisingly stable despite their apparent fragility. The image below should give you some idea of the way such structures work. Now imagine each of those three rods are a nation in Lycerius' so-called "Eternal War." You can see where I am going with this. 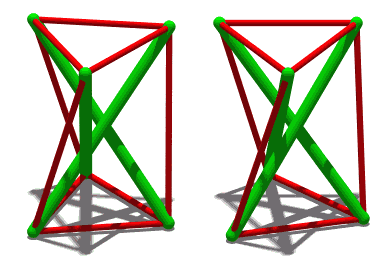 Tensegrity is a useful framework to understand what is essentially a homeostatic system. Every time progress is made towards conquering one of the three civilizations, of bringing peace to this endless Civilization struggle, the enemy AI takes an action, such as launching a nuclear strike, to bring the system back to equilibrium. In this case, the oppositional forces of the game keep the system in static endless war. It's interesting to see the player in this battle as an ineffective external force, as though Lycerius were pushing futilely on a rod in an attempt to bring down the system. In a way, we could say the game, at this point, is broken. The system ceases to care about player input. We could walk away. But, that's just not the way we behave. Reddit users have rallied around the call for help and have offered hundreds of suggestions. There is an avid belief within these comments that suggests we all know, despite the ongoing consistency of this game world, and while following the "rules" of the game, we can somehow cut one of the ropes and bring this system crashing down. Do you see what I see? The simple hope that this same motivation drives change in real world systems, be they political or otherwise? Games don't change the world, people do. And they do so by diving into systems that seem both at first glance fragile or haphazardly put together, but soon reveal themselves as immensely stable and immovable. I think it is fitting, then, that the leading suggestion in the comments at time of this posting demands the implementation of an incredibly time-consuming strategy, slowly changing the conditions of play until Lycerius can make a final move to achieve peace. The most enduring and deep-rooted homeostatic systems, be they digital or real, change most dramatically with the gradual persistence of collected individuals. Best comment about the 'civilisation' story I read so far. Indeed, the game plan is based on eternal war, which creates devastation in the long run. And throughout the centuries, many people called to end the war among ourselves, but never has it made so much money as today. Thanks Lutz! The tensegrity analogy is far from perfect, but I think it does an satisfying job of highlighting the way some political systems are maintained as a result of opposing forces (although there are also plenty of non-oppositional forces as well). Of course, after 2700 years of stalemate war in a desolate, ruined world, someone new stepped in and cleaned up the whole mess in a mere 58 years by tearing down now-irrelevant infrastructure, refocusing the economy on using the wealth of the now-ubiquitous seas, and defeating his foes in an artillery-centric blitzkrieg. I'm not sure what the lesson becomes, at this point.